The cruise port in Falmouth is more than just a place to dock ships. It is a large complex that includes shops, bars, restaurants and entertainment facilities. 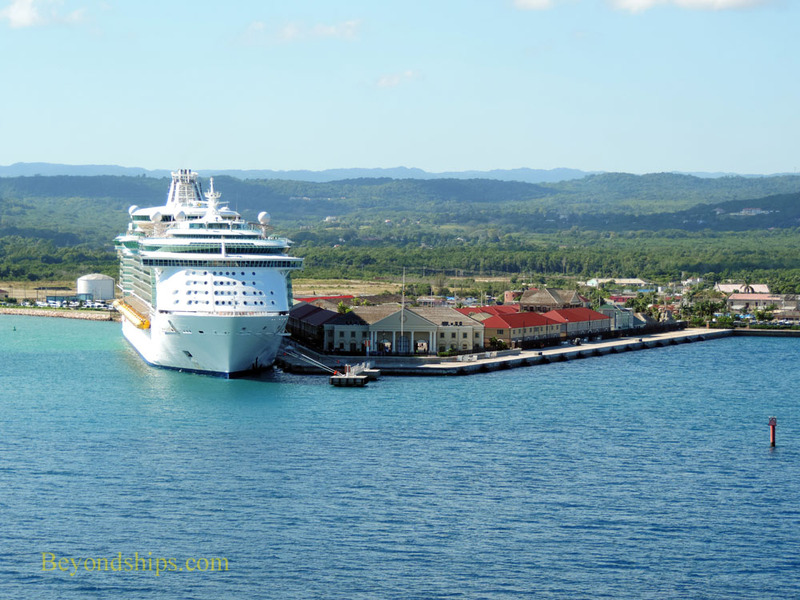 Some passengers never go beyond the gate that separates the cruise port from the rest of Jamaica. The Historic Falmouth Cruise Port openned in 2011. 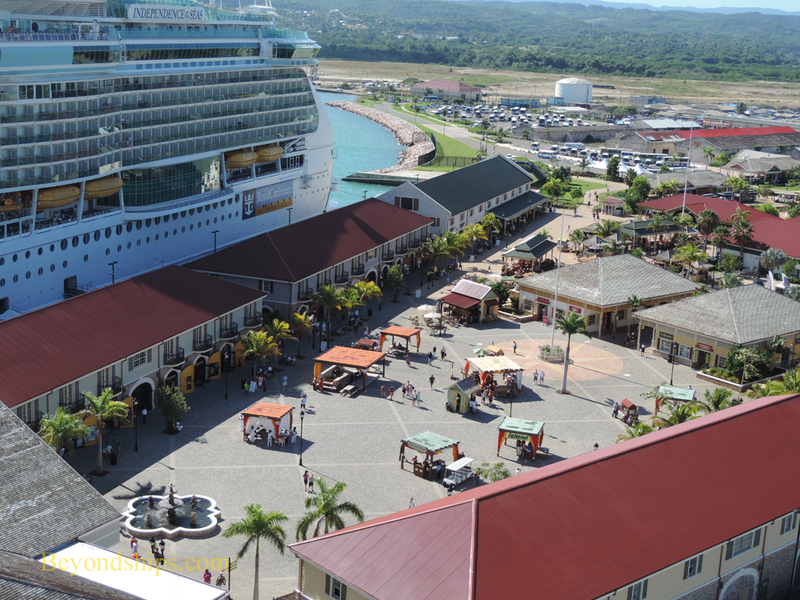 It was a joint project by Royal Caribbean and the Port Authority of Jamaica. 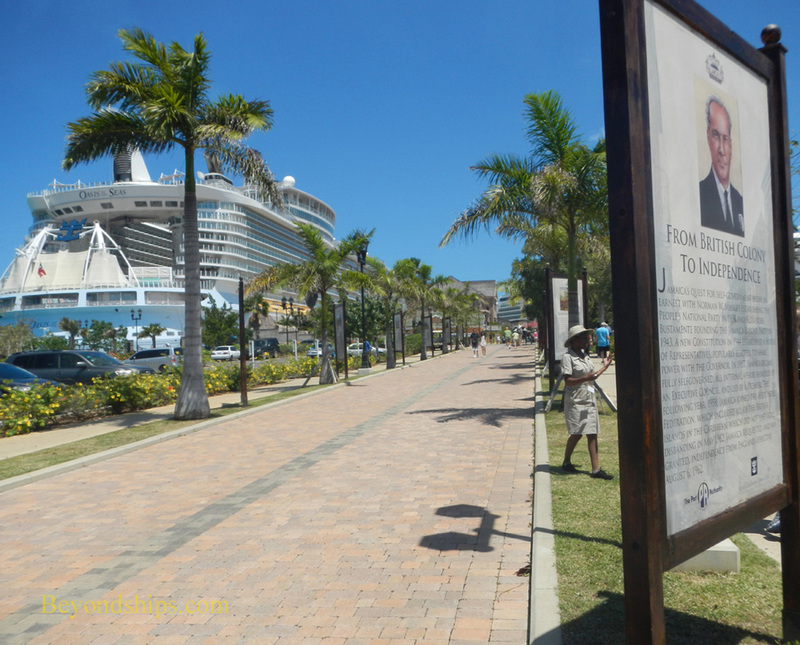 One of the driving foprces behind the project was Royal Caribbean's desire for a centrally-located cruise port capable of handling its Oasis class ships on their Western Caribbean cruises. Construction was done by a Danish firm E. Pihl & Son A.S.with financing from the central bank of Denmark. Although Royal Caribbean was involved in building the cruise port, ships from other cruise lines can and do dock at Falmouth. The cruise port is a triangular shaped peninsula with the base of the triangle attached to the shoreline. Falmouth's two cruise ship berths are on the sides of the triangle. Despite visible shoals not far from the cruise port, Falmouth can handle any size cruise ship. 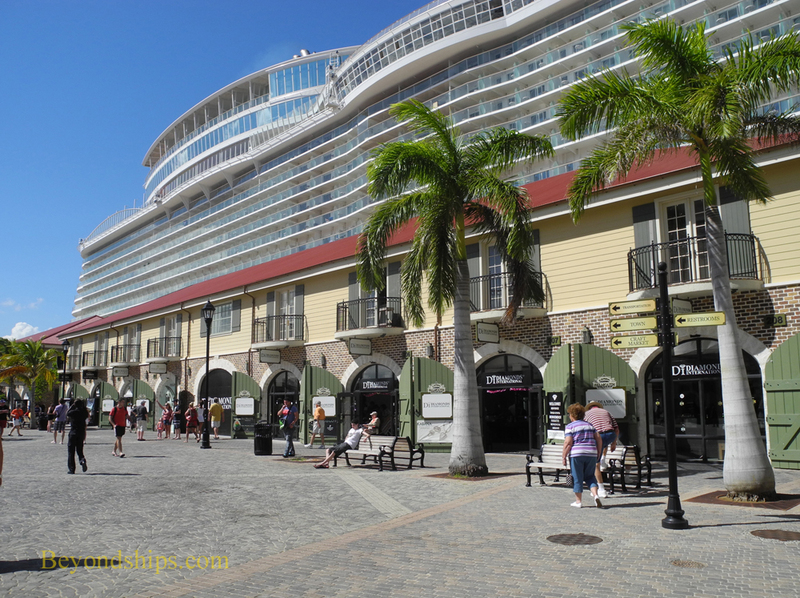 As mentioned earlier, it was constructed with the 220,000 gross ton Oasis of the Seas and Allure of the Seas in mind. Ships usually approach the cruise port, turn 180 degrees when close to the port and back into the berths. At the point of the triangle is the cruise terminal building. Guests go ashore and return to their ships through this building regardless of which berth their ship is at. Moving further towards shore, there is a another plaza called Falmouth Square with a four sided clock in the middle. However, the most eye-catching object is a life-size replica of a wrecked pirate ship on the right hand side. Behind it is a large Jimmy Buffett's Margaritaville, which includes a pool area. Straight ahead is the craft market where local vendors sell souvenirs and local craft. Off to the left is the shore excursion assembly point. Here, guests meet with the tour guides that will take them on the tours that they booked aboard ship. The buses and vans are parked nearby in a large lot. 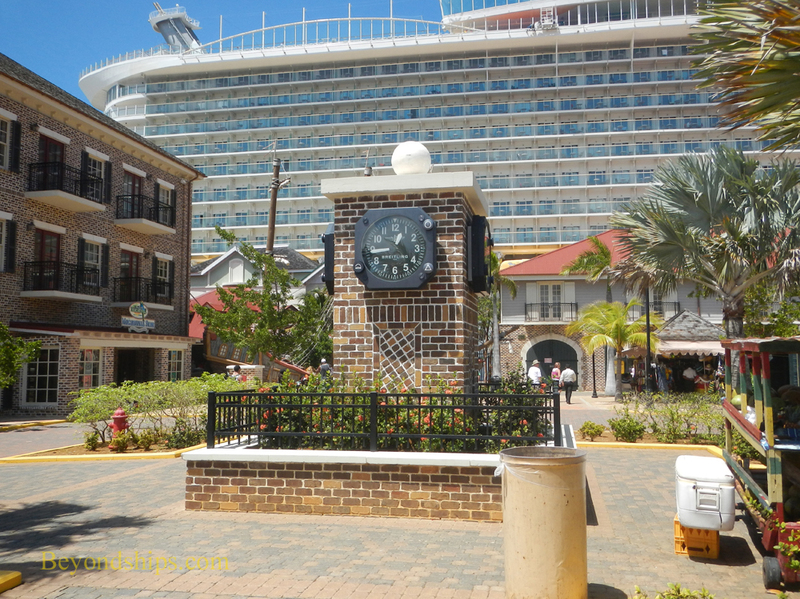 The cruise port also includes a taxi stand for guests exploring independently. Leading down to the cruise port gate is a tree-shaded drive. Between the road and the left hand sidewalk are panels telling the history of Falmouth and of Jamaica. There is security at the gate and only people who have a ship card or who work in the cruise port are allowed access. 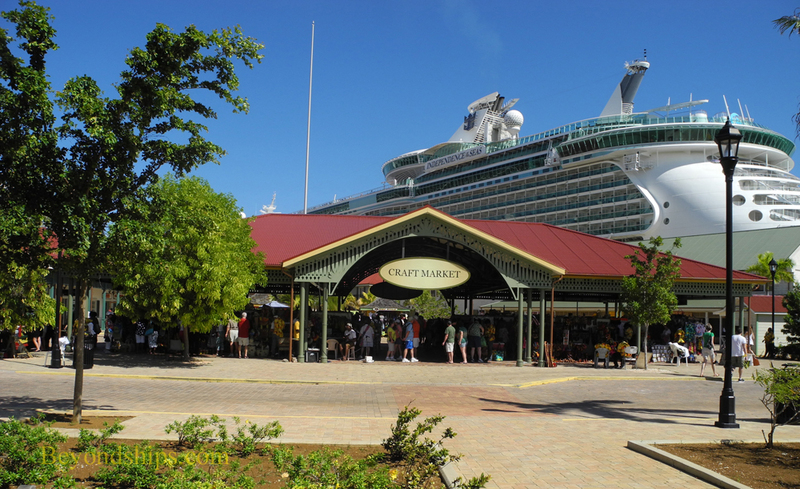 Outside the gate, local vendors often set up an open air market hoping to attract cruise guests. This began before the craft market inside the complex was complete but still continues. The center of the town of Falmouth is a short walk from the cruise port gate. There is no beach within walking distance. However, the Red Stripe Beach about three miles from the cruise port is popular with some cruise passengers. 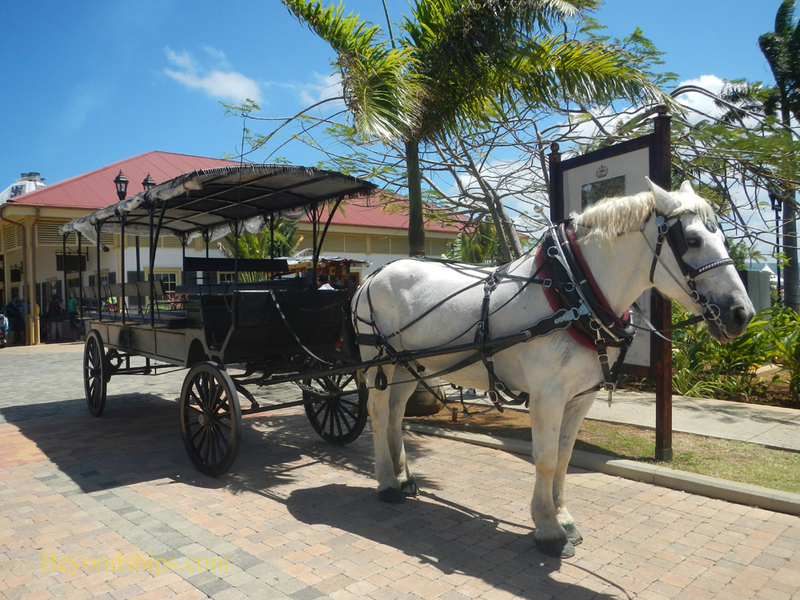 Above: Horse drawn tours of Falmouth originate in the cruise port. 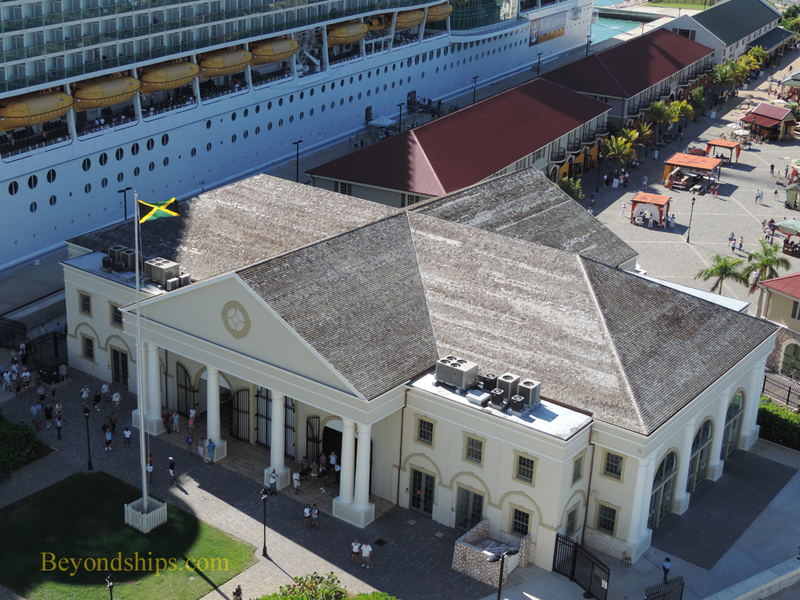 ﻿Above: The cruise terminal building. 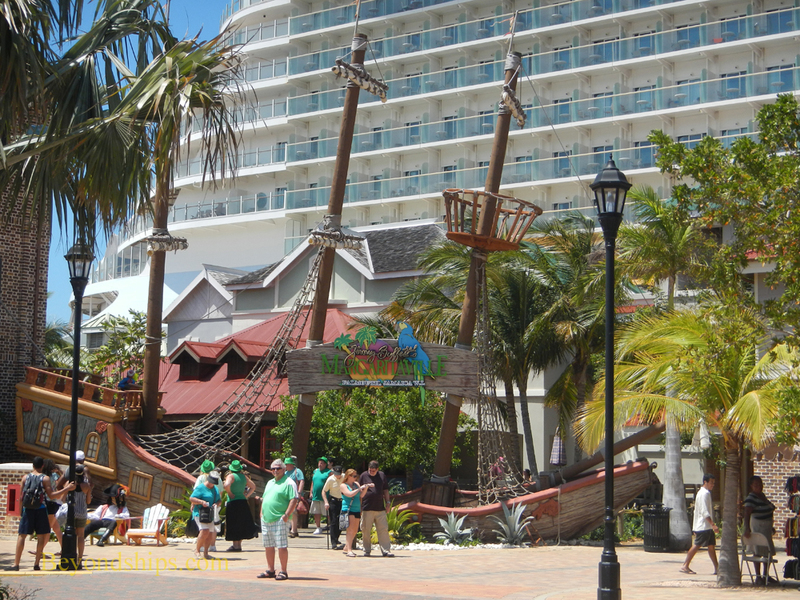 Right: A pirate ship marks the entrance to Jimmy Buffett's Margaritaville. 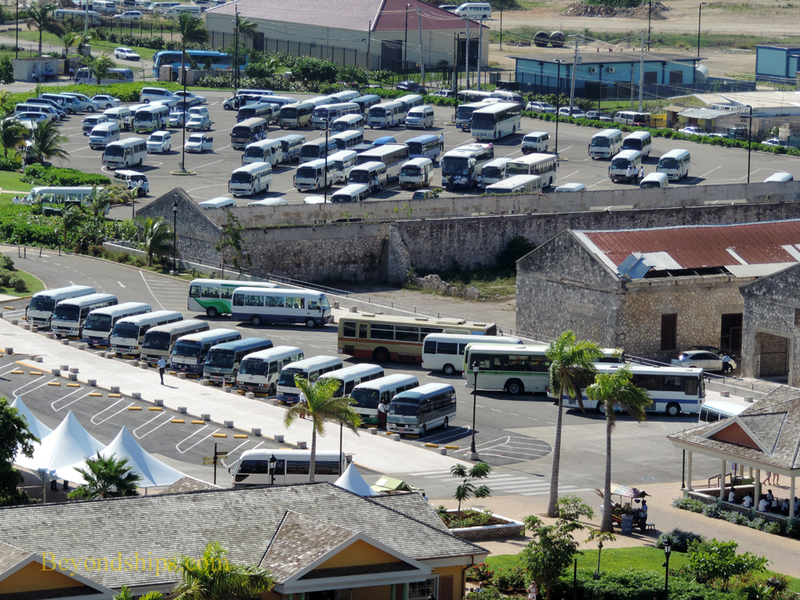 Above: Coaches and vans waiting in the shore excursion assembly point. Below: The drive leading from the terminal area to the gate.